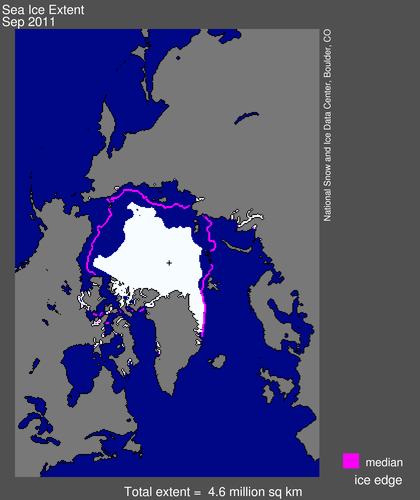 Arctic sea ice extent for September 2010 was 4.90 million square kilometers (1.89 million square miles). The magenta line shows the 1979 to 2000 median extent for that month. The black cross indicates the geographic North Pole. This September, sea ice covering the Arctic Ocean fell to the second-lowest extent in the satellite record, which began in 1979. Satellite data analyzed by NSIDC scientists showed that the sea ice cover narrowly avoided a new record low, while other data sources showed that ice extent matched or even fell below the record-setting low extent in 2007. The near-record ice melt followed higher-than-average summer air temperatures, but without the unusual weather conditions that contributed to the extreme melt of 2007. In 2007, winds and weather patterns helped melt large expanses of ice. "Atmospheric and oceanic conditions were not as conducive to ice loss this year, but the melt still neared 2007 levels," said NSIDC scientist Walt Meier. "This probably reflects loss of multi-year ice in the Beaufort and Chukchi Seas as well as other factors that are making the ice more vulnerable." Multi-year ice has survived more than one melt season and is thicker than first-year ice. NSIDC Director Mark Serreze said, "It looks like the spring ice cover is so thin now that large areas melt out in summer, even without persistent extreme weather patterns." Arctic sea ice extent reached its lowest point this year on September 9, at 4.33 million square kilometers (1.67 million square miles). Averaged over the month of September, ice extent was 4.61 million square kilometers (1.78 million square miles). This places 2011 as the second lowest ice extent both for the daily minimum extent and the monthly average. Ice extent was 2.43 million square kilometers (938,000 square miles) below the 1979 to 2000 average. This summer's low ice extent continued the downward trend seen over the last 30 years. Scientists attribute this trend in large part to warming temperatures caused by climate change. Since 1979, September Arctic sea ice extent has declined by 12 percent per decade. Sea ice reflects sunlight, keeping the Arctic region cool and moderating global climate. In addition to the decline in sea ice extent, a two-dimensional measure of the ice cover, the ice cover has grown thinner and less resistant to summer melt. Recent data on the age of sea ice, which scientists use to estimate the thickness of the ice cover, shows that the youngest, thinnest ice, which has survived only one or two melt seasons, now makes up 80 percent of the ice cover. NSIDC scientist Julienne Stroeve said, "The oldest and thickest ice in the Arctic continues to decline, especially in the Beaufort Sea and the Canada Basin. This appears to be an important driver for the low sea ice conditions over the past few summers." NASA senior scientist Joey Comiso of Goddard Space Flight Center, Greenbelt, Md., said the continued low minimum sea ice levels fits into the large-scale decline pattern that scientists have watched unfold over the past three decades. "The sea ice is not only declining; the pace of the decline is becoming more drastic," Comiso said. "The older, thicker ice is declining faster than the rest, making for a more vulnerable perennial ice cover." Climate models have suggested that the Arctic could lose almost all of its summer ice cover by 2100, but in recent years, ice extent has declined faster than the models predicted. Serreze said, "The big summer ice loss this year is setting us up for another big melt year in 2012. We may be looking at an Arctic Ocean essentially free of summer ice only a few decades from now." NSIDC scientists use sea ice extent data from the Special Sensor Microwave Imager/Sounder (SSMIS) sensor on the U.S. Defense Meteorological Satellite Program (DMSP) F17 satellite. Other data from the Japan Aerospace Exploration Agency (JAXA) Advanced Microwave Scanning Radiometer — Earth Observing System (AMSR-E) sensor on the NASA Aqua satellite, processed by researchers at the University of Bremen, showed sea ice extent falling slightly below the 2007 minimum. For a full analysis of the summer melt season and additional images, please see Arctic Sea Ice News and Analysis. An animation of the melt season is available from NASA at: https://svs.gsfc.nasa.gov/vis/a010000/a010800/a010828/index.html.